Today was the day! The family and I set out to see the Greatest Show On Earth! 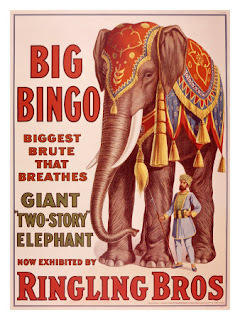 Now, you probably know that I am an avid circus buff. 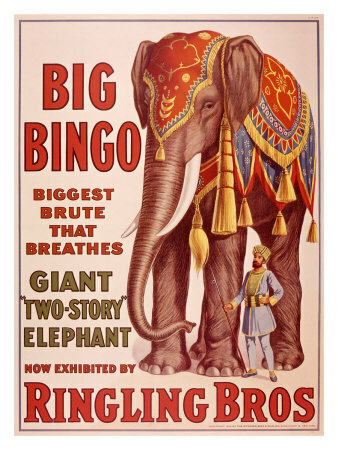 When I was a kid, the circus was one of my favorite things. Ever. I remember keeping my first program for decades. The centerfold was a picture of that year's graduating class from Ringling's Clown College. I looked at that picture a lot and dreamed of a world where I was a pink-haired buffoon bringing joy to millions, travelling all over the country with the Big Show. Some of my most magical memories are from dark arenas, flashlights spinning madly as children of all ages scream into the night because they are astounded by three rings of entertainment. Flying trapeze! Gunther Gabel Williams taming the big cats, even draping one over his shoulders! Human cannonballs, jugglers, clowns... all of it. The smell of the arena, the sound of a brass band... the circus is one of my absolute favorite settings of all time. Many of my dreams take place in a musky tent in the middle of a dusty town. So... getting to take my five year old daughter to her first circus? Priceless. Rear tire lost its tread. We limped to my mom's place and arranged alternate means to get to the circus. (After the show, we got all four tires replaced on the car and all is well. )But first, our day started off more like Serenity. You know that opening scene where Mal is all "did the primary bumper panel just fall off my ship?" and Wash is all, "this could get interesting?" Yeah (click that link and watch it if you don't know what I'm talking about)... well, Sean and I were in the car and we had a bit of a moment. In the role of Mal? Your beloved Wahine (me). Playing Wash (even wearing the obligatory Hawaiian shirt) was my husband. So, for the past 6 years, Sean has done most of the driving of my car. I'm usually just the captain while he pilots. It's my boat, he gets to drive. In that time, he's put a few holes in my ship, but my mister and my car have held together. As of late, he says that he's heard a knocking and we'd planned to do car work this weekend. Flash to us on the I-10 toward the circus when this knocking becomes an outright shuddering. Then, there's a loud thud, a smash of something against metal and the back wheels got loose for a moment. But, no body flies like my mister...he righted the car without incident and pulled over to the shoulder to assess the damage. Now, the show....the lights went down at US Airways Center and flashlights and glow-in-the-dark scimitars came to life. Drums rolled and soon, the arena floor was home to a parade of sequins, brightly colored stilt-walkers and running liberty horses. Elephants lumbered in trunk-to-tail. It's hard to tell which was more stunning, the glittering costumes or the light in my daughter's eyes. I admit it. I'm a dork. I cried. 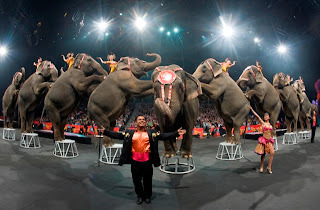 I have such warm, fond memories of the circus, that getting to share them with my daughter was epic. It was magical in a whole new way. THIS is what makes being a parent so amazing. Sharing experiences with your children that are new to them...remembering what it's like to live in wonder. Throughout the show, I found myself lamenting that this is not the same show I saw in the '80s. It lacked the spectacle, the pomp...but at the same time, I was under the spell of the circus. The singular charm of the center ring. My kiddo squealed and laughed and screamed and marveled at the whole thing. She loved it. And she fell asleep during the second half of the show. *grin* That's part of it, too, isn't it? That kind of safety and innocence. While ponderous pachyderms perched perilously on their plinths, my little girl slept. I wonder what she dreamed of. We got home safely. New memories. Laughter. And a souvenir program. Sadly, there's no centerfold of clowns like mine had. But this one is just as magical to her as mine was to me. And that's something. Dinner and a Mythbusters mini-marathon have punctuated an adventurous day. An adventurous week!